This is an invitation to all Modern & Contemporary American Poets MOOC (ModPo) participants, SCoPE community members, CPsquare members, ELESIG members, FSLT13 participants, POTCert participants, colleagues and friends, and the wider open network to join us in two open webinars to reflect on your learning experiences and discuss emergent learning in MOOCs and open learning environments. See http://scope.bccampus.ca/mod/forum/view.php?id=9408 for further details of the Webinars. In these webinars we will be sharing some thoughts about our experiences in MOOCs and other courses, in my case ModPo, and inviting participants to do likewise. In particular, in the second webinar, we will encourage participants to reflect on their learning to draw a visualization of their learning experience – a Footprint. This is a visualization of my reflection on my ModPo experience at the end of Week 10, the end of the MOOC. In these drawings (we call them Footprints) we consider the relationship between 25 different critical factors that can influence the learning experience with particular reference to the balance between prescriptive and emergent learning. There is not room here to explain this in detail. We will do this in the webinars and further information can be found on our open wiki and in our published papers – which you can find here and here. Drawing footprints is a way of surfacing deep reflection, tacit knowledge and understanding about learning in complex learning environments. This is how I have described my learner experience at the end of the course (the end of Week 10) which is depicted by the Footprint image above ……. ModPo has been a bit of a roller coaster ride for me. I have lurched from being thrilled by it, to feeling excessively irritated, from marveling at the open minds of the poets to whom we have been introduced, to feeling that I do not have the competence to understand them, from being disappointed in aspects of the MOOC pedagogy to being really impressed with the way in which the MOOC has been run. This is reflected in the footprints I have drawn at various stages of the course. 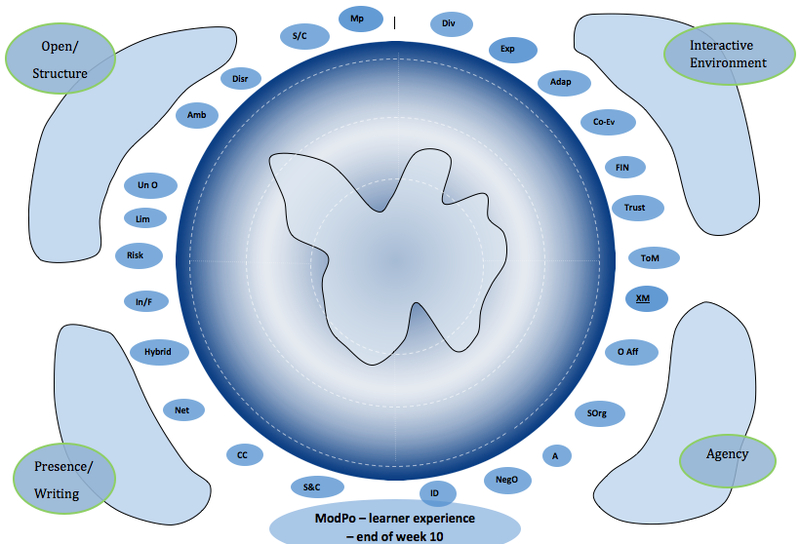 Reflecting on my experience of the last week of the course, I find that my perception of the balance between emergent and prescriptive learning in this MOOC has once again shifted more into the ‘sweet’ emergent learning zone (The pale white zone on the footprint is the emergent learning zone. The darker central zone is the prescriptive learning zone. The outer darker zone is the challenging zone, moving towards the edge of chaos). The footprint I have drawn shows that there are a number of factors that remain in the prescriptive zone. There isn’t a lot of ‘Risk’ in the ModPo environment, or opportunities for the course to be self-correcting or adaptive. There is limited variance in the learning pathways and not really any possibility that I could see of negotiating outcomes. My perception is that these constraints on emergent learning are a result of the design of the Coursera platform. I also imposed constraints on myself by choosing not to engage in the forums and towards the end of the course I stopped watching the webcasts. For myself I had to balance engagement with the heavy load of poetry we were required to read and engage with, with the demands of engaging in the overloaded forums. I chose the former and instead to engage with the MOOC from my blog. I have blogged each week of the course. The result has been a mostly sweetly emergent learning experience, i.e. ModPo has been a positive learning experience. I do not feel part of the ModPo community (it has been a ‘purple in the nose’ experience*), but I have found the introduction to poets and their experiments highly stimulating and relevant to my work in education. *(A story from Etienne Wenger). I have tasted the wine and know there is a lot to know about the wine, but I don’t feel part of the wine-tasting community, I don’t understand their language (purple in the nose) and I don’t think I want to become a member of this community. I will remain at the boundaries of the community. This is my experience. It is valid for me, but of course there is no way in which it could be said to be representative of the 36 000 ModPo participants. For that we would need many ModPo participants to draw a footprint and share it. Hence the invitation. And the invitation is equally open to all interested in online learning experiences. We already have many examples of footprints from participants on a range of courses and would welcome more. The more we have, the more we can begin to unpick what it means to learn in open learning environments. We hope you will join us in the webinars. Everyone is welcome. Discussions about our recently published paper, Footprints of Emergence, continue, particularly with respect to the relationship between curriculum design intentions and the learner experience. We have been discussing the paper with the CPsquare community, a group of academic colleagues from FH JOANNEUM, ZML-Innovative Learning Scenarios and others. These discussions are ongoing and we share our current thinking on this wiki . Anyone who is interested in Footprints of Emergence is welcome to join. Our experience (i.e. the authors of Footprints of Emergence) is that drawing a footprint from the design perspective and from the learner experience perspective can result in very different images for the same course. This raises the question of whether designer intentions and learner experience can be aligned. If they can’t, then to what extent can the learner experience be validated by anyone other than the learner? At this point I need to explain that the learner experience in terms of ‘identity’ development, is for me what learning is all about, but whether or not this can or should be ‘assessed’ is another question. I can’t see that the curriculum/course/learning environment designer will ever be able to ‘control’ the learner experience, however prescribed the curriculum or however heavily assessed. So what then is the designer’s role? A number of teachers talk and write about the need to first ‘create the space’ in which the learner can grow and develop their identities, and then facilitate learning within that space. If this is true and learners need ‘space’, why do we still see the design of heavily prescribed, content heavy courses? In addition, online learners seem to need and take/create more space than f2f learners, i.e. contemplative learning space. What does the need for ‘space’ mean for the design of blended learning, integrated online and f2f learning, and a prescribed curriculum? Another point that keeps cropping up in discussion is the extent to which learners need to be pushed out of their ‘comfort zone’ to promote significant learning – possibly through providing a non-prescriptive, less structured learning environment. At what point does the learning environment become so chaotic and ‘unsafe’ that learning is compromised/jeopardized? Should we expect learners bend to fit the curriculum/learning design or should the learning design bend to fit the learner? This is a difficult question if you don’t know who your learners are going to be, e.g. in MOOCs. So finally, at what point is a mismatch between design intentions and learner experience constructive and at what point is it destructive and how might this affect emergent learning? These two aspects of communities of practice (and there is obviously overlap between them) can also be seen in Etienne Wenger’s publications, e.g. his 1998 book ‘Communities of Practice. Learning Meaning and Identity’ – focuses on expanding ideas around social learning theory, whereas a later book ‘A Guide to Managing Knowledge: Cultivating Communities of Practice’ (2002) – is written more for managers of communities of practice. It seems to me that these two approaches, i.e. one on learning, the other on business, could affect the role of the facilitator. The asynchronous discussion in CPsquare which started at 3.00 pm GMT yesterday and will conclude at 9.00 pm tonight was initiated by Brenda Kaulback, Lisa Levinson, and Doris Reeves-Lipscomb as a way of reflecting on the changing nature of their work and in the light of their recent participation in open learning environments such as MOOCs. Has your scope of work moved from cultivating walled gardens to supporting do-it-yourself landscapes? Are you spending less time on convergent activities which create a sense of belonging, a sharing of common interests, and forging of mutual norms and more time on divergent activities in which individuals control their own learning choices, build their own personal networks and land for short periods of time in ad hoc gatherings? Do you see these new developments as creating possibilities for your role or as putting you out of business? What impact, if any do these shifts mean for the learning facilitator’s value, and marketing that value? The discussion is ongoing, but what is coming out of it so far for me, is how difficult it is to pin down exactly what a learning/community facilitator does, as it seems so very context dependent. Facilitating a MOOC, for example, will be very different to facilitating a community of practice such as CPsquare, or to facilitating an online learning course. My first experiences of online facilitation were guided by the work of Gilly Salmon and her two books E-moderating and E-tivities. These books propose a very ‘hands-on’ approach to facilitation and were designed to help a teacher make the transition from working f2f to the online environment. I still find Gilly Salmon’s approach very useful for facilitating small, task-oriented online courses. But recently my learning experiences have increasingly been in massive open online courses (MOOCs) where the large numbers of participants prohibit a heavily ‘hands-on’ approach to facilitation. In these environments the role of facilitation lies more in the hands of the participants themselves – in peer-to-peer facilitation. So if there isn’t a facilitator in these environments, who does the organising? There is certainly a ‘convenor’ – but is that the same as a facilitator? The convenor’s role is to provide the learning space and invite people into it. The convenor also provides the ‘syllabus’ / timetable, provides some, but not all, resources (such as links to readings) to stimulate discussion, and explains how the course works (see for example ChangeMOOC ). The convenor then withdraws and lets the learners get on with it. S/he may or may not engage with discussion and doesn’t attempt to moderate or summarise it. Ask what support they might need with the technology – have they used Blackboard Collaborate before? Do they need their slides uploading? Will they want to show video within their slide show? Will they need a practice run beforehand or will it be enough to come into the session half an hour early? Ask what help will they need during the live session? This week Jonathan Silk, a US Army Officer stationed at the United States Military Academy at West point, NY, shared his digital story telling practice with the CPsquare community. For this digital storytelling work he won the 2012 Pepperdine Award for outstanding work in community development. Storytelling is used in many organisations as a knowledge management strategy. Through storytelling tacit knowledge is elicited and shared for the benefit of the whole organization. Jonathan has shared his own story in a blog post ‘Why I tick when I run’. In the US Army, storytelling has been used to great effect within the MILSPACE Community of Practice to share leadership stories from the field; this has been the subject of Jonathan Silk’s action research. The key point that came out of Jonathan’s CPsquare presentation and the discussion, was that although storytelling is a powerful tool for binding a community, it needs to be managed carefully in terms of the technology, in terms of the stories and commitment to gathering those stories, and in terms of learning from the stories. The MILSPACE community uses an ordinary video camera. Videos are edited on a Mac with Final Cut Pro . The Army has a designated person to do this editing and to date has over 1500 video stories of 3-5 minutes in length. The main issue for the MILSPACE community has been to make the videos easily accessible to community members, easy to search, and easy to comment on and discuss. JCarousel is used to support this and recent work has focused on tags and video titles. Appropriate titles have been found to be very influential on the number of times a video is viewed (see Jonathan’s report for further details). The MILSPACE community has over 20,900 members and focuses on the leadership development of cadets, lieutenants and captains in the US Army. Stories are collected in the field. A dedicated team went out to locations such as Iraq and Afghanistan to create the videos. Leaders were almost universally keen to be interviewed and understand that sharing their stories and learning adds value to the whole community. Video interviews can be conducted with a single leader or with a group and are usually around a given topic, e.g. eight leaders have given video interviews on the topic of ‘Your first 30 days in a country’. The stories can be highly emotive and elicit deeply reflective thinking. This requires careful, sensitive and experienced management by the interviewer. Trust and positive relationships are essential to the story collection process and it is understood that the videos are ‘owned’ by the interviewees. No videos are published without the consent of the interviewee, although they are carefully screened for any potential security issues. The collection of over a 1,500 videos does not necessarily mean that they are used effectively for learning. The MILSPACE community is currently exploring means of increasing discussion around the videos. Recent work has involved developing a more structured approach to the management of discussion around the videos, through establishing groups of topic leaders (peer panels) who make personal contact with interviewees and seed discussion and comments around the videos to build learning relationships. This is work in progress. It is not difficult to understand what a powerful effect video stories could have on the learning of a community, particularly one such as the US Army where as Jonathan Silk has put it the cycle between action and reflection is so fast and chaotic that it’s difficult to capture the learning. This potential has been recognized and supported by the hierarchy in the US Army, which has devoted technology and manpower to the process. Wenger, E., Trayner, B., and de Laat, M. (2011) Promoting and assessing value creation in communities and networks: a conceptual framework. Rapport 18, Ruud de Moor Centrum, Open University of the Netherlands. I found Jonathan Silk’s presentation very interesting and valuable, because it helped to clarify the issues surrounding the collection and management of video stories. It will be interesting to see how the work develops. (This post has also been copied to the CPsquare blog).